HTC Valve may be one of the best high-end VR headsets on the market, but that doesn't mean it'll remain in its current form for very long. Take the new depth-sensing 'horn' that's been teased by a scientist working for Intel. Rumoured to be planned for a propor unveiling at the Intel Developer Forum in a couple of weeks time, the camera was prematurely shown off by one Dimitri Diakopoulos, a product scientist and prototyping engineer working at Intel's Perceptual Computing Lab. According to Diakopoulos, the camera would fit directly onto the front of the headset's HMD and would serve as a means of sensing nearby objects and stopping you from pumping into them. 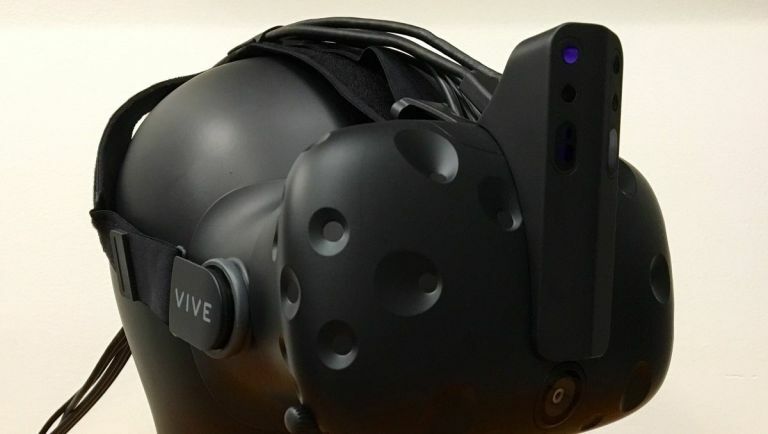 The device utilises six different cameras, although Diakopoulps did confirm the device wouldn't knock off the Vive's precise weight as each camera weighs a mere 10 grams each. There was no confirmation as to whether the depth-sensitive add-on will be incorporating Intel's RealSense technology, but considering that proprietary tech is gesture based and a perfect fit for such a device we wouldn't be surprised to learn of its inclusion in the near future. While Diakopoulos has discussed certain details, the original tweets have since been deleted so there's a good chance this reveal wasn't something Intel was planning on quite yet. Still, be sure to check back on T3.com during the Intel Developer Forum which runs from 16-18 August. Elsewhere, Valve has confirmed that its 3D tracking room scale technology is following the Vive gamepad into the world of open sourcing. In other words, Valve is more than happy for you to take these standout features and build your own homebrew tech. This royalty free approach is a great step forwards for third-party peripheral development, opening up the door for a raft of new accessories that could transform the way we interact with VR on HTC Vive.